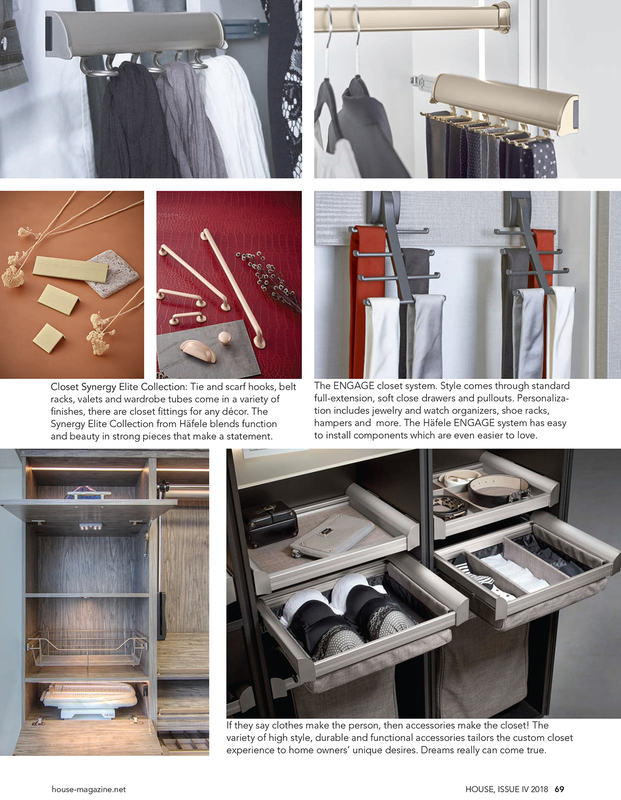 Storage designers can organize your life and add luxury to your spaces for a very reasonable investment. Many people don’t realize the flexibility of styles available, and that your storage designer can tie the design closely to your home décor. Your closet specialist can work with your interior designer and your contractor by scheduling installations in a way that makes sense for your project. Tip #1: Schedule time for an in-home consultation with your closet designer. A thorough consultation ranges from 1-2 hours. He will measure your space, assess your storage needs, and if time allows, start planning the layout and design while you’re still together. Meeting in your home allows your storage design specialist to work with you to fine-tune your design, choose color pairings, and door/drawer selections that complement the mood and style you enjoy. Tip #2: Make sure to remove enough items from the closet, pantry or other space so that your designer can properly measure. Being able to see the corners and ceiling, to observe hidden utility panels or molding, can make all the difference in the end result: a tightly fitting, custom sized storage system. 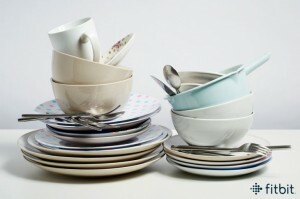 Provide an inventory of your possessions and if possible, show her the items for a quick measurement. Similarly, let her know if you store your shoes in boxes so that she can build in customized shelves to accommodate them perfectly. Tip #3: If you’re already working with an interior designer or contractor to complete your remodel, introduce your closet designer to the other professionals involved in the project. This will simplify any necessary coordination of scheduling and deliveries, ensuring that everything goes smoothly. A simple change of floor molding size, ceiling height or door opening can be communicated this way, before the storage system is manufactured. Of course, if you’re looking for a great painter or interior designer—ask your closet designer—there’s nothing like a recommendation! Tip #4: Your schedule for painting, carpet or flooring installation/finishing, and other tasks is crucial information for your closet designer. Your new custom storage system should be installed at the end of your remodel or renovation project. Tip #5: For those who live in a condo/co-op or other multi-unit building, it’s helpful for you to facilitate the conversations with building management. You probably haven’t thought about it in a while unless you’ve done other recent construction, but as a rule, buildings have strict requirements regarding insurance, scheduling time to use the freight elevator, and service entrance. Your assistance with those conversations can save a lot of frustration. Establish a rule that when a new coat, shirt, or pair of shoes comes into the house, an old one must go in the give-away pile. The wintertime is sock-time–go through the sock drawer. Look for those with holes or without a match, or those that never fit right, and get rid of them. Instead of taking the sweaters from off-season storage and squeezing them into the closet, take a moment to look through them. Some are likely well-worn or ill-fitting, or haven’t made it off the shelf in years. Those can go into the give-away pile, leaving more room in the closet for the ones you enjoy wearing. Once everything has been sorted through, take stock of what you have and need. Do you need more or less sock storage—maybe sweaters can be hung on pant hangers instead of folded on shelves (or visa versa). Bins and baskets can be great ways to store socks or gloves, hats, and scarves as well. 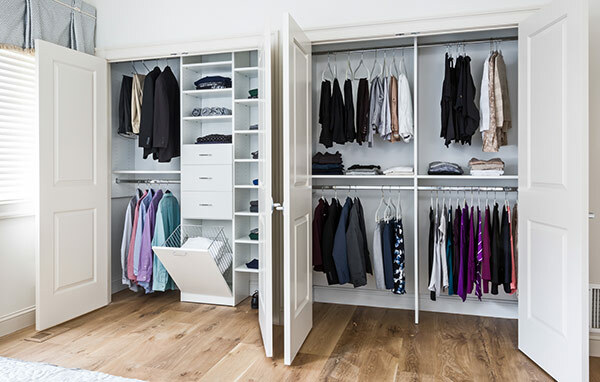 If a total closet make-over is needed, you can call a professional closet designer to develop a tailored solution. Take a serious look through the coat closet. Which of the coats never got worn last year? Probably it never fit right, or is just not your style. Put it in the giveaway pile. Sort through the winter-wear drawer. Most people have more hats, gloves, and scarves than they wear. If your favorite style gloves are worn out, now is the time to buy a new pair, before the stores are out of stock. This way, you can also find room for that gorgeous new scarf. Look through the winter shoes, boots, slippers, booties. Again, now is the time to replace that worn out favorite style with something new that you love, and will wear all winter. The winter shoes often get stored near the door in a pile. Consider the possibilities of a mud room with customized shoe storage. Once the snow starts falling, this could also accommodate the wet coats, hats and gloves. Take a look at the give-away pile and smile! This is all stuff that cluttered your space. If you take it away, you can find the clothes you love, and buy replacements for worn out favorites without worrying about where to put them. Best of all, there are so many charities that can take away your give-away items. There are veteran’s organizations, coat drives for the homeless, clothing drives for kids in need. You can clear your space and help people – a very good result. 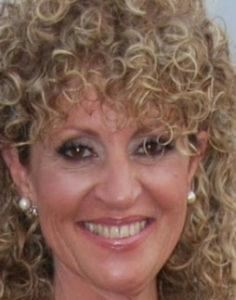 About Wendy Lepkoff Long Island, New York based Wendy Lepkoff specializes in residential interior design projects. 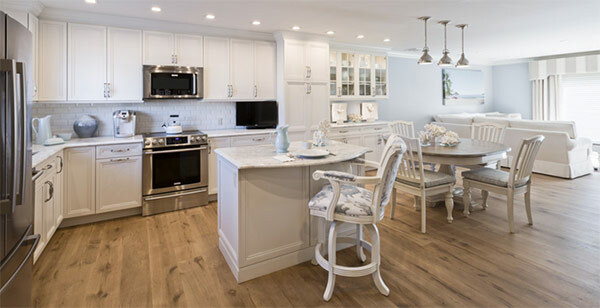 Wendy Interiors, Inc. is a full service design studio offering design consultation, space planning, custom furniture design and space renovations. Wendy creates custom interiors with a collected feel that reflect the personality/vision of her clients. She seeks out furniture and accessories and assembles collections of unique pieces for her projects. Wendy is an excellent guide throughout the design process. Knowledgeable and intuitive, she has an ability to articulate visually and verbally exactly what her clients seek. From the grand view, down to the most intricate detail, Wendy’s finesse enlivens any room. This home began as a bachelor pad. When the homeowner got married, he promised his wife that they would redo the townhouse. The wife is a very organized person and preferred everything to have its place. The clients wanted to make the most out of the limited space they had. This was a challenge because the 2-bedroom townhome did not have a garage or basement for extra storage. Wendy needed to find a way to utilize every possible space. Wendy and Bonnie determined how to overcome this obstacle. The result: the neutral, relaxed design remained consistent throughout the kitchen and living room area, into the home office and other built in storage areas. All-white, shaker style, custom built ins in the home office created a clean-cut and streamlined appearance. Although the home office has more of a contemporary vibe than the rest of the interior design, there are still seaside details distributed lightly throughout the space. The theme throughout the home was an updated, fresh and organized look. From the light fixtures to the lighter pieces of wood placed in different areas of the home, and the silver and chrome hardware – the home has a complete, consistent vision—and Wendy makes the whole project appear effortless. To ensure the space was utilized to its greatest organizational potential, Bonnie measured everything the clients own, including vacuum cleaners, cat carriers, coolers, beach chairs, folding chairs, blankets, wrapping paper, etc. 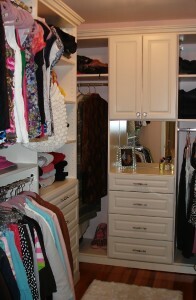 The client was able to fit everything into their new closet with room to spare. Wendy needed to find creative storage solutions for the clients. She was able to do that by moving their washer/dryer upstairs, adding pantry space. She continued the kitchen cabinetry into the dining room, to create a generous amount of counter space and cabinet space. Wendy explains a little bit about why she enjoys working with Bonnie on these special projects, “Having Symmetry Closets do the clients wall of bedroom closets and walk in closet saved them the space they needed for a closet in their office as there was no clothing overflow from the bedroom. The office closet literally became their garage/basement. Our closets start out organized—what happens? We forget to sort through our stuff as we buy more, for one thing. And as we use them, we put things back in a hurry, and our closets get messy. 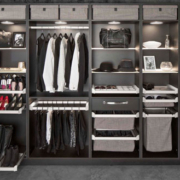 There are techniques and strategies to keeping a closet organized over time. These are a few of our tried and true best recommendations to tame your linen or clothing closets. Rule of Three: Sheets per bed, towels/hand towels/wash cloths per person. This provides one in use, one in the wash, and one in the closet. Guest items: One or two is sufficient (sheets, towels, etc). Group items either by type (queen sheets) or by room (bath #1). Bulky items like quilts or pillows can be stored in compression sacks (vacuum activated) to stay fresh and condensed. Seasonal items like holiday tablecloths and beach towels should be stored on high or low shelves. Slide out shelves work well for table mats and cloths, baskets and bins can neatly hold napkins and rings. Resist the temptation to buy linens on sale without giving away an old set. It will keep all the linens looking uniform and will keep the allocated space from creeping into other areas. Linens get musty when there’s not enough air circulation. Be sure to leave room around and above the stacked linens. If needed, a simple open baking soda container will remove any odors and keep the closet fresh. Group clothing by length, type or purpose: Business clothing can be in a single section, with pants and shorter skirts hung together. Men’s or women’s suits can be grouped with color coordinated shirts, or outfits can be hung together. Install a tie rack or belt rack nearby, and your outfit is almost complete. The goal is to be able to glance into the closet, pick out your outfit, and go about your busy day. Put away Dry Cleaning: When the drying cleaning comes home, it often gets hung on a valet rod or hook., and gets used as needed. This creates a bulky obstruction in the closet, and empty bags and hangers. A better technique is to take five minutes right when the clothes are brought into the closet. Quickly remove the bags and hang everything on proper hangers, in the area you’ll look for them. Recycle or dispose of the bags, and return the wire hangers to the dry cleaner. Arrange seasonally: Even if you don’t have off-season storage, there are ways to remove those items from view. Create a zone for the clothes, in a less accessible part of the closet. Use a high shelf for boots or sandals, bins or baskets for smaller items. You’ll get in the habit of not looking at the off-season area, and will have a selection of seasonally appropriate items in your main area. Organize folded clothing by type and color: How often are you looking for a blue tee shirt, or a workout top, and can’t find the one you want? Pick part of a shelf for shorts or sleeveless tees, for exercise gear or lounge wear. You’ll be able to find what you need every time, without wasted time and frustration. Shoe storage: In addition to the designated area for off-season shoes, it is useful to set aside less used shoes. If space allows, store these in labeled plastic bins or shoe boxes high or low in the closet. If not, try to store them in another closet or under the bed. This method should free up space for frequently worn items. Grouping business shoes near the business clothing is optimal, like sneakers with the gym clothes and shorts. We want to make room to buy new things, and we want to keep our closets organized and neat. By using the tactics above, we truly can have it all! Just remember when it’s time to make the seasonal clothing changeover, look through the clothes. See whether anything is stained or getting tattered and get discard it. So much stuff can be given away, to have a second life with those who need it more. (1) Check the Laundering Instructions…and do what it says: This is the simplest piece of advice you’ll ever get! Better yet, before falling in love with that beautiful shirt, jumpsuit, piece of lingerie in the store….look at the label and decide whether you’re really willing to do the hand-washing or other special treatment required. Delicate items need a little mesh bag and a place to hang after washing. 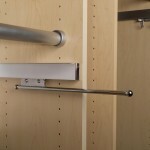 Take a look at the pull-down rods and valet rods that can be added to your laundry area. When needed, they’re right there and when you’re done, they slide out of the way! (2) Set Aside Ironing Space in the Laundry Room: Some of us love ironing, have a dedicated area and lovely lavender scented spray for our linens. But even if you’re a dedicated Permanent Press person, clothes sometimes come out of the dryer too wrinkled to wear. 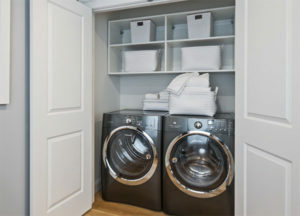 Many laundry areas are right in the main part of our homes, next to the kitchen, or in the master bathroom. We don’t want to have a huge ironing board in the middle of everything—the solution? Fold-out ironing boards! Wine: Sprinkle salt on the stain to minimize saturation. Soak in cold water or borax solution for 30 minutes. Wash as usual. Coffee: Soak in cold water. Then apply a pre-treatment product and wash as usual. 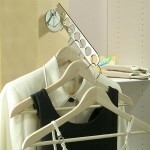 (4) Invest in Better Hangers: Using covered hangers, your clothes stay on the hangers in your closet. When you wear them, your clothes will fit nicely, without dimples or distortions. 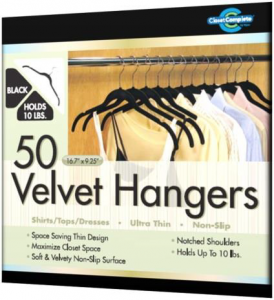 As an added benefit, the inexpensive felted hangers are space savers. You can fit more neatly hung clothing with these then is possible with a hodgepodge of tangled up hangers. 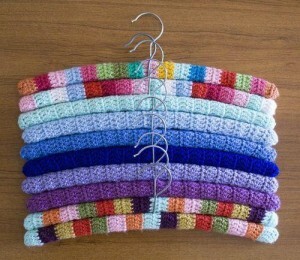 If you’re feeling creative, check out the fun & functional yarn covered hangers. Dry clean only garments? Try vodka—it’s not just for drinking anymore. Vodka makes an effective deoderizer, and is less expensive than a special cleanser. Using a spray bottle, spray the musty item all over. Then hang it outdoors until dry. If you have an outdoor space, hanging clothes in the fresh air is always effective, time-tested, and free! Check the labels to confirm that they’re machine washable. Sort by color in the washing machine, no soap and add 2-3 cups of clear vinegar to the wash cycle. The vinegar smell only lasts for minutes; they’ll smell fresh and new after drying. 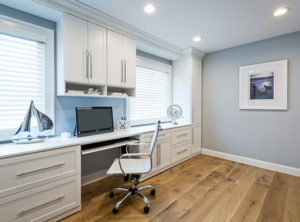 By Sharon McGovern, Editor of NARI NYC/LI Design & Remodel Sure it’s great to do your research online before making any large home improvement purchase – in fact most homeowners search the internet to select products. But do you really know the quality, benefits and features of what you’re getting? Our NYC/LI NARI experts want you to know why it’s imperative that you test drive products before making a major purchase for your home. “Most customers think they know what they want, and then they see all the options available and change their minds,” said Jason Ashe, National Sales Manager for WindowRama. “We understand the importance of a customer touching and trying out products – windows and doors can be big ticket items in larger renovation projects,” he added. WindowRama offers 40 different brands of windows and doors, so the product selection process can be overwhelming. “Our showrooms are a destination – customers can see windows and doors in a real world atmosphere – similar to rooms in their own home,” Ashe said. A popular trend in home renovation and design is indoor/ outdoor living. 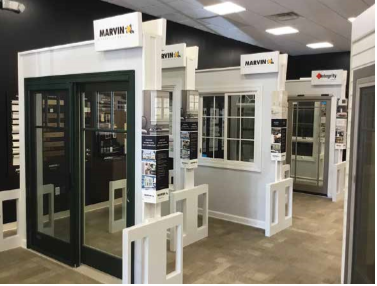 WindowRama’s 6000 square foot superstore in Farmingdale showcases multi-fold patio doors and screens so homeowners can see how these large doors operate. “We want the consumer to be excited about their purchase,” Ashe added. 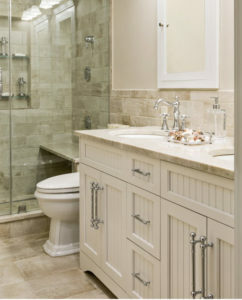 Green Art Plumbing Supply also implements the latest and greatest innovations for the home into their showrooms. Customers can explore possibilities that were merely ideas, until now. 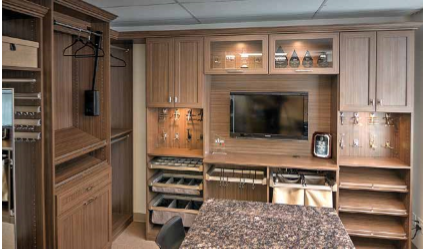 Green Art Plumbing Supply’s Huntington Station showroom features exquisite kitchens and baths as functional displays – providing a chance to experience products firsthand before making a decision. 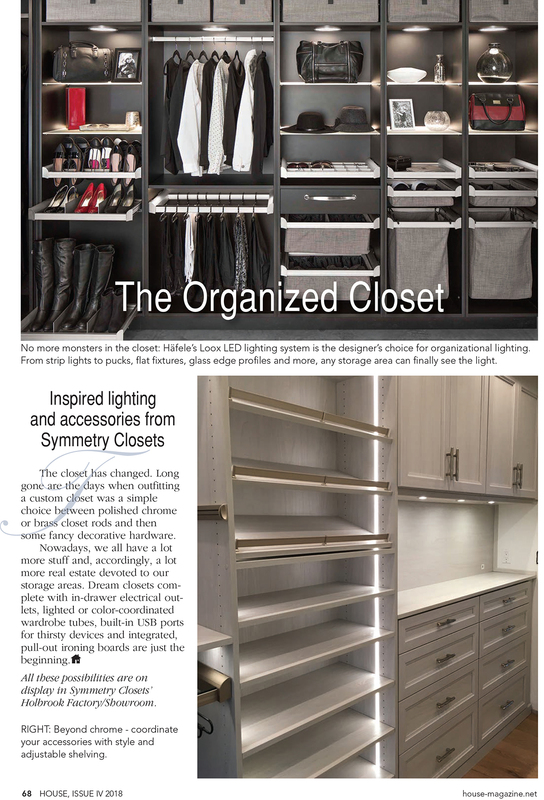 Lighting really makes a difference when you’re looking at materials, especially in custom closet and organization design. There’s LED lighting, strip lighting, drawers that light up and motion sensors that light up a space when you open a door. “There are so many lighting choices – cool, warm – unless you visit a showroom, you can’t experience that for yourself,” said Reich. According to Cambria USA spokesperson Aliki Vrohidis, different lighting can also affect the way you read colors, tones and movement in each of Cambria’s natural quartz countertop designs. “Additionally, our HighGloss and Cambria Matte surface finishes reflect light differently, so it’s important to see them both in person and in the correct lighting to see which you prefer,” she added. 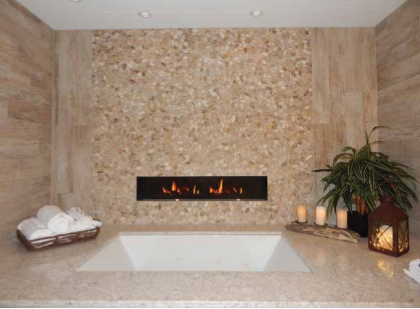 Cambria’s natural quartz design samples are a small select cut from a slab; they do not fully exhibit all the design characteristics of the final installed product. 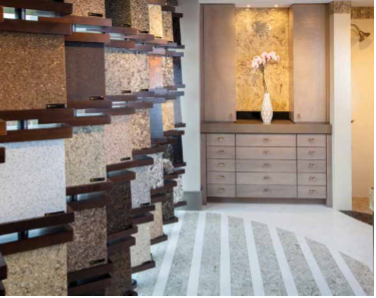 Variations in the natural quartz stone color, pattern, size, shape and shade are unique and inherent characteristics of the product. “Prior to making a purchase, we recommend viewing a full slab of the design’s movement in one of our showrooms or galleries,” Vrohidis said. Equally important to the experience of the showroom is a great team to work with. “Our incredibly knowledgeable, friendly, and dedicated staff provide the best personalized service in the industry,” said Green Art Plumbing Supply’s Stephanie Kurtzman. Symmetry Closets has earned the service industry’s coveted Angie’s List Super Service Award, reflecting an exemplary year of service provided to members of the local services marketplace and consumer review site in 2014. “We are delighted to receive the prestigious Angie’s List Super Service Award—two years in a row,” said President Bonnie Reich. “People invite us into their homes, to customize their bedroom closet storage, or ask us to design closet organizers for their kitchen pantry and other spaces. We’re so appreciative that everyone takes the time to write on Angie’s List about how happy they are with their new built in closet organizers. 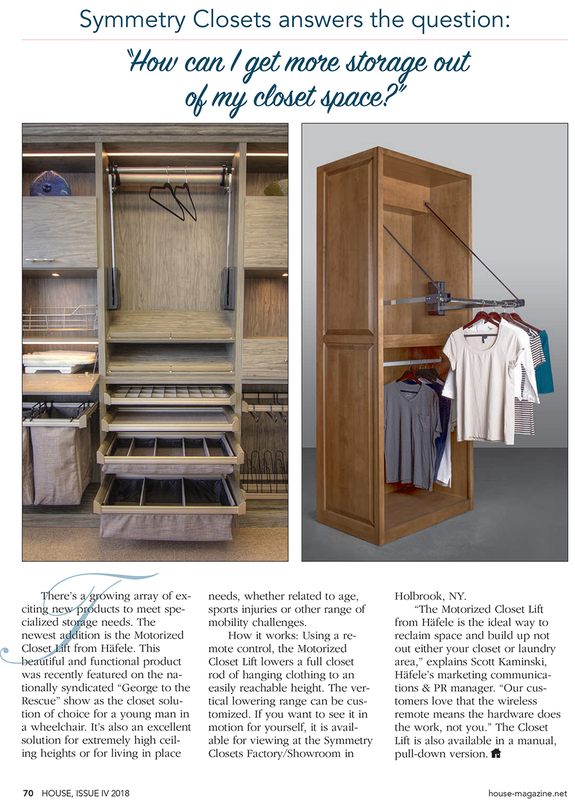 It truly makes our day!” “Only about 5 percent of the Custom Closet companies on Long Island have performed so consistently well enough to earn our Super Service Award,” said Angie’s List Founder Angie Hicks. “It’s a really high standard.” Angie’s List Super Service Award 2014 winners have met strict eligibility requirements, which include an “A” rating in overall grade, recent grade, and review period grade; the company must be in good standing with Angie’s List, pass a background check and abide by Angie’s List operational guidelines. Service company ratings are updated daily on Angie’s List. Companies are graded on an A through F scale in areas ranging from price to professionalism to punctuality. Angie’s List helps facilitate happy transactions between nearly 3 million consumers nationwide and its collection of highly-rated service providers in 720 categories of service, ranging from home improvement to health care. Built on a foundation of authentic reviews of local service, Angie’s List connects consumers directly to its online marketplace of services from member-reviewed providers, and offers unique tools and support designed to improve the local service experience for both consumers and service professionals.